“People don’t have any morals anymore, apparently,” American Legion Post 83 financial officer James Hiles told the South Bend Tribune, neatly summarizing the case of over 300 bronze medallions stolen from the graves of military veterans in Patton Cemetery. Perhaps even worse, the thieves aren’t after the bronze medallions, which would be too easily identifiable to fence. They just want the brass fittings that hold the medallions. The fittings are said to be worth only $35 each. A pile of almost 80 discarded medallions was found in the spring, on the far side of a fence near the Civil War section of the cemetery. Some of the vandalized graves actually date back to the Revolutionary War. With these cases of vandalism skyrocketing, Post 83 is adopting a strategy used by other American Legion posts facing similar crime waves: replacing the brass fittings for stolen medallions with aluminum and steel fittings that have little value as scrap so they won’t be appealing to thieves. “Close to $2,000 dollars has already been raised and donations can be directed to the American Legion not just to replace the missing markers but to purchase ones for future veterans,” the Tribune writes. 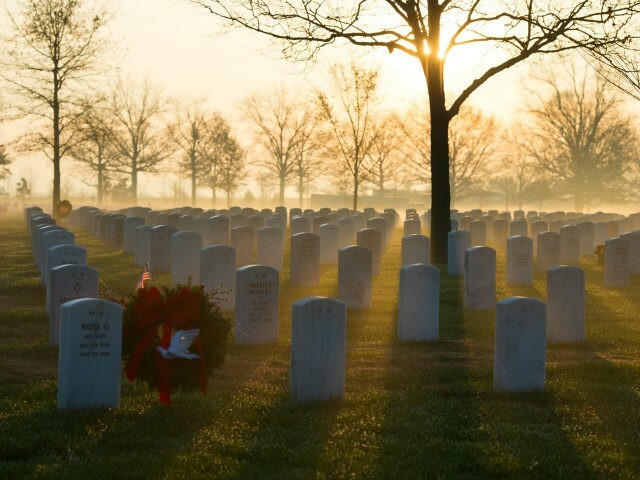 Alas, vandalism against the graves of veterans is far too common, with a spike in such crimes typically occurring around Veterans Day, Memorial Day, the Fourth of July, and Labor Day. Some of this year’s outrages were perpetrated against very old gravesites, including others of Revolutionary War vintage, as with the Patton Cemetery in Indiana.